Admit it: The cans of leftover paint stowed in your garage or basement are making you crazy. 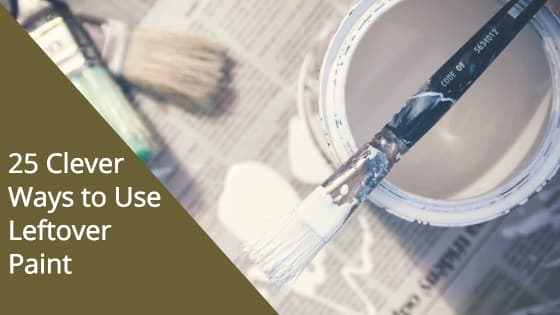 But, you’re a thrifty soul–waste isn’t something you are comfortable with—-which is why finding purposes for leftover paint can benefit both your limited storage space and your conscience! Your first job is taking an inventory to see which hues are within the same color range (use this chart to decide), and then show off your creativity by using our 25 ideas to revolutionize the way your home is decorated. Pick one idea. Try them all. Claim bragging rights when you show off your handiwork. Your biggest challenge? Figuring out how to re-purpose space once those paint cans are history! 1. Paint the furniture that’s been hiding in the attic because it looks so shabby. 2. Spruce up your exterior by refreshing shutters and trims with a lively new color. 3. Define the “territory” of kids sharing rooms by painting walls in contrasting or complementary hues. 4. Stencil designs on walls using a variety of colors and stencil guides. 5. Improve your kitchen by painting old cabinet fronts to add style and appeal. 6. Double frame art by painting a wall section that’s 1-foot larger than the frame’s parameters. 7. Paint old picture frames the same color to make a stunning a wall collage. 8. Be an alchemist: mix colors to create a large supply paint to re-do an entire room. 9. Use light-colored leftovers as primers when you need all the coverage you can get. 10. Make a wall chalkboard by mixing ½-cup acrylic paint per 1 Tbsp. unsanded grout. 11. Borrow more ideas from Pinterest. 12. Paint exposed bathroom or kitchen pipes a contrasting color for a high-tech re-do. 13. Accent your walls by creating broad, contrasting stripes from ceiling to floor. 14. “Color” pine cones, shells and small items to place into an original centerpiece. 15. Channel Picasso by creating works of art using slabs of plywood as your canvas. 16. Use leftover paint to decorate unique craft projects, like flower pots and figurines. 17. Turn industrial salvage into sculptures using recycled paint and your imagination. 18. Morph shabby stools into works of art by painting them in several vibrant colors. 19. Spruce up a boring hallway by painting each room’s door a different color. 20. Turn 2 wood ladders and plywood into shelving, then paint the unit fun colors. 21. Paint 12-inch x 4-inch wood strips myriad colors to make a border for your garden. 22. Morph a boring wood deck into a dramatic setting by “painting” a rug on the deck floor. 23. Paint one wall a contrasting color to create a room-expanding optical illusion. 24. Lavish bookcase interiors with paint to make a gallery for art and memorabilia. 25. Use up lots of inventory by painting a huge rainbow on the wall of a child’s room. Once you’ve used up all of the paint, wash out the cans and turn them into workshop lampshades or punch decorative holes into cans and turn them into lumenaria filled with sand to support candles. Use fabric or patterned plastic adhesive materials to turn clean paint cans into utensil carriers for backyard picnics. Involve the kids in your creative adventures so they have an opportunity to appreciate your recycling efforts by letting each child personalize their own paint cans. Place them on a shelf next to your backdoor so they remember to grab the pens, tissue, report cards and snack bags they tend to forget on busy mornings. Not particularly crafty but you’ve still got paint left? No worries. Donate your stash to charities like women’s shelters, Habitat for Humanity and non-profits that would be delighted to use up your gift for any number of paint projects at their facilities!